Power inverters can be an important device to have when you’re on the road or in your vehicle, where a place to plug in your normal electronics may be absent. Normally the kind of power that comes from a vehicle is DC, while most electronics and appliances require AC power. It is in these situations where an inverter is especially useful. The basic function of an inverter, beyond converting the power source, is to provide standard electrical outlets so that you can plug in whatever you desire. Beyond this, there are a ton of extra features that manufacturers tend to add, although it may not be necessary if all you need is a source of power. This Tiger Claw unit can put out 1500 watts of continuous power, with peak surge output of 3,000 watts. This is more than enough to power devices like computers, HDTVs, game consoles, smaller microwaves, and so on. There are inverters out there that can output quite a bit more, but they’re also quite a bit more expensive. In general, this Tiger Claw is about in the middle in terms of the range of watt output for power inverters. This doesn’t matter so much as the kind of devices you plan on powering, and it can already power quite a few of them (as mentioned above). This Tiger Claw inverter doesn’t have a whole lot in the way of extra features, but it does have a few basic features such as high voltage protection, low voltage alarm and shutdown, and automatic shutdown in case of a short-circuit. An important feature that it offers over ordinary inverters is pure sine wave output. This allows the unit to have continuous, stable power output for as long as the battery or power source remains charged and/or operational. An ordinary inverter will try to approximate sine wave output, causing small fluctuations in power that can add up to damage or sub-par operation on sensitive electronics. This is why the Tiger Claw inverter is appropriate for things like computers or TVs (not to mention its high watt output). 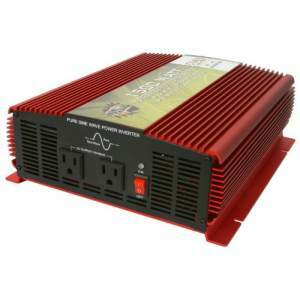 Selling at a relatively good price, the Tiger Claw does a little bit better on price in comparison to other 1,500 watt inverters on the market. The main reason for this is that the Tiger Claw does not have any special features like an LCD display or GFCI protection. Its high watt output combined with its simplicity in design and its pure sine wave signal can be quite appealing to those who are on a budget. It’s an overall recommended purchase. With Tiger Claw’s pure sine wave inverter, the front of the unit has two outlets, a switch, and terminals on the back side. Nothing more, nothing less, and for some people this might be just the right amount of functionality. If your needs are very basic, however, this is probably a good purchase to make if you want a little bit bang for your buck. Therefore, we give this 1500 watt model a rating of 4 out of 5 stars. when the tiger claw pure sine wave inverter come back to market on amazon?? We are not sure. It’s currently unavailable. We are anxiously awaiting it as well. Check out the Sunforce pure sine inverters as they are comparable!